NOTRE DAME, Ind. – No. 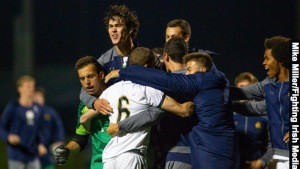 15 Notre Dame (7-3-1, 3-1-0 ACC) earned a big ACC victory on Saturday evening at Alumni Stadium, knocking off No. 6 Louisville (6-2-2, 3-1-1 ACC) in overtime by a final score of 2-1. The Irish have now won four straight matches. Senior Thomas Ueland played a major role in both of Notre Dame’s goals against the Cardinals, scoring the opener off a volley in the 10th minute and creating the penalty kick in the 92nd minute. Senior Sean MaCleod found the back of the net off the penalty kick, scoring his second goal in as many outings. The Irish were on the front foot from the opening whistle to begin the match. The Cardinals almost gifted Notre Dame the opening goal, as freshman Jack Lynn intercepted a backpass and rounded the Louisville keeper. His first touch took him wide and he sent an effort on target but a Cardinal defender got back and cleared the shot off the line. Just minutes later the early pressure paid off, as the Irish scored the opening goal in the 10th minute. Felicien Dumas whipped in a dangerous cross from the left flank, which a Louisville defender knocked into the air. Lynn won a header in the box, sending the ball to Ueland, who volleyed a shot just inside the far post past the oncoming Louisville goalkeeper. Notre Dame nearly doubled its lead in the 30th minute. After a ball was played into the box, Blake Townes had a shot from close range that the Louisville keeper saved. Aschieris pounced on the rebound and fired a shot off the woodwork. The Irish took the one-goal lead into the halftime break. Louisville started strong in the second half and managed to tie the match at 1-1 off a strike from Cherif Dieye from just inside the box into the far bottom corner of goal. After the opening 10 minutes of the second half, the Irish settled in and controlled the match for the majority of regulation, creating a number of chances that they were not able to capitalize on. The contest remained level after 90 minutes, forcing an extra session. The Irish wasted no time in overtime getting on the attack, as Ueland broke into the area in the 92nd minute. The senior was hauled down from behind by a Louisville defender, leaving the referee no choice but to point to the spot and award the penalty. Sean MacLeod calmly approached the spot and converted the goal, delivering the Irish the 2-1 victory. The victory was Notre Dame’s fourth over a ranked opponent this season. The Irish have outscored the opposition by a combined score of 11-2 in those four wins. The Irish improve to 12-6-1 against the Cardinals in the all-time series. Notre Dame is now 4-3-0 against teams ranked at the time of the match in 2018. The Irish have not allowed a goal in the first half of play in any match this season, spanning 495 minutes. Notre Dame has allowed just one or no goals in nine of its 11 matches this season, including six straight. Ueland scored his third goal of the season and 11th of his career. After recording the first goal of his career in Notre Dame’s last match against Northwestern (10/6), MacLeod found the back of the net again on Saturday against Louisville. Goalkeeper Ryan Krutz improves to 5-3-1 on the season.